The term xenoestrogen is derived from the Greek word for ‘foreign’ which gives you a clue what they are and what they do. Xenoestrogens are nonsteroidal compounds which mimic the activities of the hormone – estrogen in both females and males. Nonsteroidal refers to the fact the estrogen is not produced naturally by the body’s endocrine system. Xenoestrogens are becoming a modern health concern. These hormone mimicking chemicals are far more common than they were and they may be linked to many health conditions. Xenoestrogens are found in various household products including cleaning products, hair dyes, gardening products, cartons and plastic bags. There is no agreement among experts on the dangers posed by xenoestrogens with many maintaining that the health risk they pose being minimal. However, the fact that these foreign estrogens are now found in so many everyday products means that more people are becoming more and more exposed. Xenoestrogens are most often associated with plastics and pesticides but they actually include mycoestrogens derived from fungi and phytoestrogens which are dietary estrogens we get from plants. Xenoestrogens are sometimes known as EDCs (Endocrine Disrupting Compounds) or as environmental hormones. When they are used by choice as pharmacological estrogen, xenoestrogens can actually be beneficial. Examples include their use in hormone replacement therapy for menopausal women or their use as a contraceptive pill. Because a xenoestrogen acts in the same way as estrogen, it can increase the hormones in your body. This increase in hormones can result in normal endocrine function being disrupted. We are now seeing xenoestrogens accumulating in our ecology at an ever increasing rate. It is becoming a cause for alarm both as an environmental hazard and also a real health concern for some. Because many xenoestrogens are able to make their way to our food supply or even into our bodies directly, there may well be cause for concern. Precocious puberty is a rare condition in which puberty begins at a very early age. When children develop secondary sexual characteristics before the age of eight for girls and nine in boys, they are said to have precocious puberty. Epidemiological studies in several parts of the world including two conducted in the United States show that girls are maturing sexually at a younger age. Similar observations have been made in Europe and in Asia. Exposure to the chemicals like xenoestrogens in our environment is widely believed to be a contributory factor. While estrogen is known as the female hormone and it is healthy in the right levels, it can cause numerous unwanted effects if it is present in large amounts. Too much estrogen can cause irregular menstruation as well as some very serious physical affects and psychological damage. Precocious puberty for example results in a growth spurt and early bone maturation. This can cause a serious condition resulting in a significant reduction in adult height. Precocious puberty is also linked to several gynecological conditions including infertility, endometriosis, adenomyosis and polycystic ovarian syndrome. Although it is known as the female hormone, men also have lower levels of estrogen in their bodies. There are many risks for men associated with a high level of estrogen. A high level of estrogen can have a dramatic effect on the male reproductive system such as low sperm count and low testicle weight. It is also associated with an increased incidence of testicular cancer, abnormal or deformed reproductive organs and undescended testes. Women with a history of certain hormone related cancers, should avoid any substances likely to elevate their estrogen levels. Because if the way estrogen mimics the hormone’s effects, they may also accelerate the severity and growth of certain cancers. It is believed that xenoestrogens may adversely effect breast cancer, ovarian cancer, prostate cancer and uterine cancer. 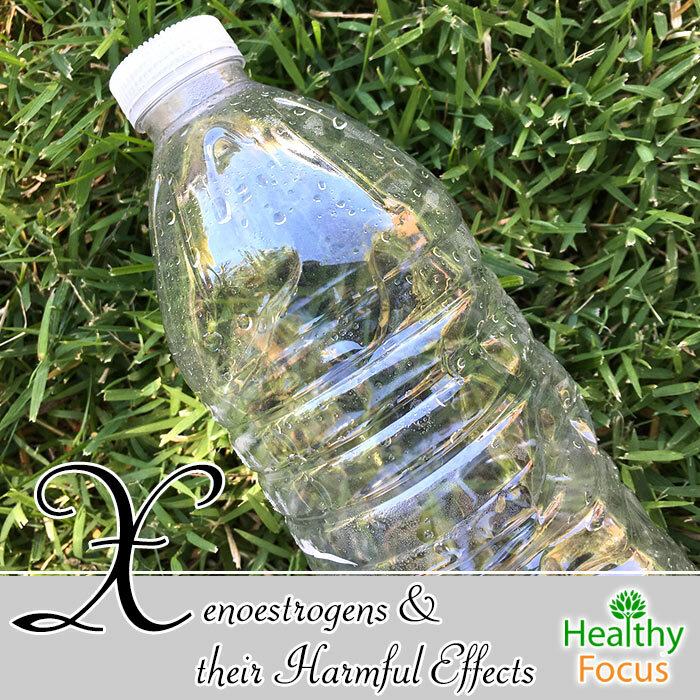 Xenoestrogens can cause major disruptions to the body’s delicate balance of hormones. This can lead to a variety of serious health effects ranging from impaired immune function to poor thyroid activity. Xenosetrogens are so problematic for several reasons. Xenoestrogens bind with the hormone receptors creating excess levels of estrogen in your bloodstream. This causes a condition referred to as estogen dominance. Having an excess of estrogen in the body leads to an array of symptoms including hair loss, fatigue, lethargy and irregular menstruation. Whereas natural hormones are processed easily by the body, xenoestrogens are much more difficult for our bodies to process. They ultimately end up being stored in our fat cells and accumulating which can cause more complications. Avoiding xenoestrogens entirely is becoming more and more difficult and the list of everyday products which contain them is becoming longer all the time. The following list is by no means exclusive but gives you some idea just how prevalent they are in today’s environment. Skincare products : Many commercial skincare products including sunscreen, nail varnish and make-up contain xenoestrogens. Try using less of these products or making sure that the ones you use are more natural. Do some research and read any ingredient labels; you should be on the look-out for skincare products that contain Benzophenone and parabens. Plastic products : The world seems to be filling up with plastics products. Plastic is used to make bags for your shopping, water bottles, lunch boxes, wrapping film and so much more. Food Preservatives : A chemical called Butylated hydroxyanisole (BHA) is found in some food preservatives and has an accumulated effect with natural estrogens. Where I live in Thailand, the amount of plastic is incredible. Some stores insist on giving you a plastic bag to carry your small amount of shopping even when you expressly tell them that you do not need one. Plastic spoons are given in plastic wrappers to eat yogurt straight from a plastic pot. Aside from the environmental damage done by so much plastic, this overuse of the material could have serious health consequences in the future. Non-Organic Fruit, Vegetables and Cereal : If you buy non organic plant produce, there is a very good chance that it has been treated with chemical fertilizers and pesticides. It may be more expensive but try opting for organic produce instead. Household Cleaning Products : Many of your regular products for cleaning the house contain xenoestrogens such as alkylphenol ethoxylates. As we have already mentioned, avoiding these harmful xenoestrogens is becoming more and more difficult but it is still possible to minimize your exposure by changing some of your eating and lifestyle habits. Try following these guidelines if it is possible…. Buy organic fruit and veg. Organic products tend to be more expensive but they are more nutritious and have not been sprayed with harmful chemicals before hitting the shelves. Try buying hormone free meats and dairy produce. Organic animal products are the best option. Avoid storing your food and drinks in plastic bottles and containers. Use ceramic or glass instead. Switch to organic skin and beauty products. Use unbleached linens and sanitary products. Our modern lifestyle and financial situation makes it hard to avoid xenoestrogens entirely but it is not impossible to significantly reduce your exposure.